They are also one of the main centres for postgraduate teaching in the country, with over 5,000 postgraduate students from all over the UK and another 147 countries. In the 2014 Research Excellence Framework, they were ranked in the top 10 universities in the UK for research power, with 80% of their research classed as world-leading or internationally excellent. The university has been ranked first out of 16 participating Russell Group universities for 'overall international student satisfaction' in the latest International Student Barometer survey. The University of Leeds has hosted Chevening Scholars since 1983, taking in 1,162 scholars in that time. Leeds says: 'We aim to attract outstanding students with leadership potential from across the world to our study programmes, with an emphasis on diversity, ensuring that they create a distinctive and internationally relevant experience for all students. 'By partnering with Chevening, we are able to increase knowledge and opportunity for international scholars, who are then able to take this knowledge back to their own country and act as worldwide ambassadors towards the UK and the University of Leeds. Who do the University of Leeds support? The University of Leeds welcomes applications from all Chevening-eligible countries in any subject. All applicants who wish to be considered for an award at Leeds are encouraged to select the university as their first preference within their Chevening application. 'Not only does the university provide you with high-quality teaching, but Leeds is also a city known for its culture and artistic spirit. 'Leeds is definitely the right place to immerse yourself in the British culture. The city has provided me with everything I ever wanted to experience, from the West Yorkshire Playhouse, which houses gripping, live theatre, to the tranquil countryside and the lively city centre. 'Leeds is a truly enchanting place to the extent that you cannot be alone. In Leeds, you can still enjoy your favourite dishes, from Middle-Eastern to Indian cuisine. The city is very vibrant with food, culture, and people. 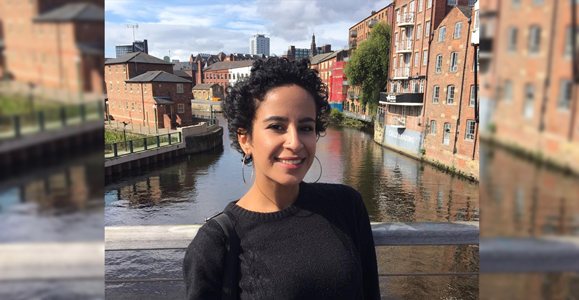 - Read more in Haleemah's blog post about her first three months in Leeds here.